While equities have yet to determine if terrible news is good news (we already knew that "bad news is good news" until today), the continuation of devastating economic data in combination with the Fed's capitulatory response has sparked a selloff in what is arguably the most important asset class of all, if only for the Fed: inflation expectations. 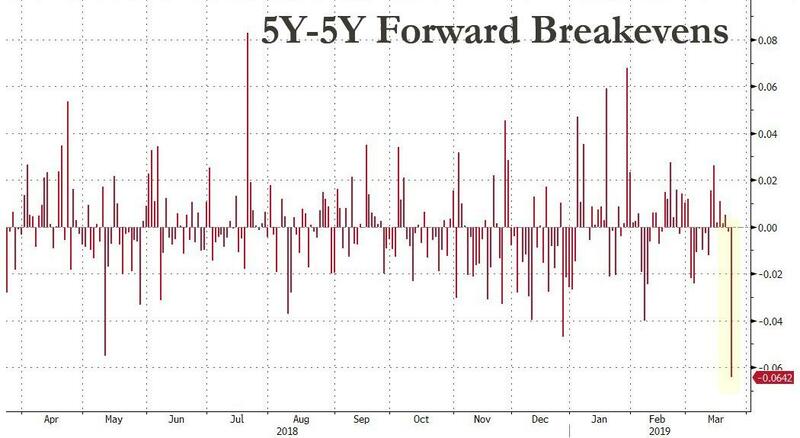 And looking at the 5Y-5Y Forward breakevens, which are derived from market-based inflation expectations between 5 and 10 years into the future, i.e. a testament to whether the Fed will be successful in reflating the economy over the medium to longer run, we are seeing the biggest drop in this series since July 2017. But what is far more concerning, is that today's violent drop took place after the most powerful dovish surprise by the Fed in recent history: in other words, for the Fed to surprise even more - and spark higher inflation hopes - it would have to either cut rates or launch QE. A classic dovish fed should push real yields lower and breakevens wider(more accommodative Fed = more economic activity and thus more inflationary pressure); we saw exactly that play out after the January FOMC as well as in the immediate aftermath to Wednesday's meeting. However, today, we’re seeing both real yields and breakevens fall which is better described as a negative growth shock. We’d point to weak data out of Germany out overnight and the ongoing recalibration of global growth expectations. As Hill concludes, "It’s been a key question as to whether the FOMC’s dovish pivot could avert a global synchronized slowdown" and according to the market Friday, the answer is now a resounding no.